Home American Papi Chulo – Who’s your Papi? 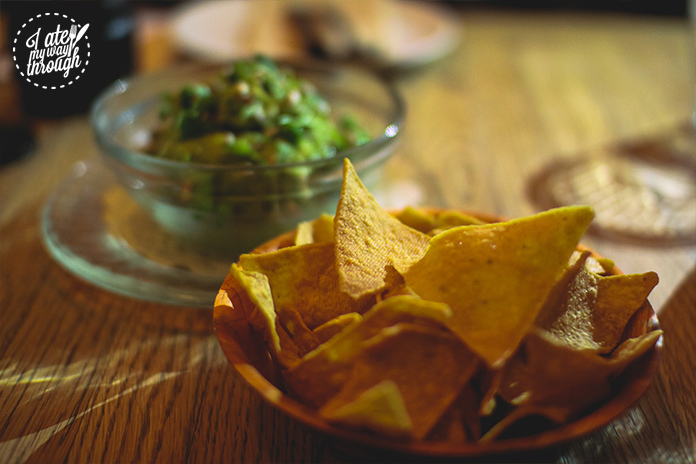 Merivale has launched a new mid-week special at their venue Papi Chulo, humorously titled “Who’s your Papi menu?”. The restaurant sits on Manly Wharf, a short 30 minute ferry ride from Circular Quay. 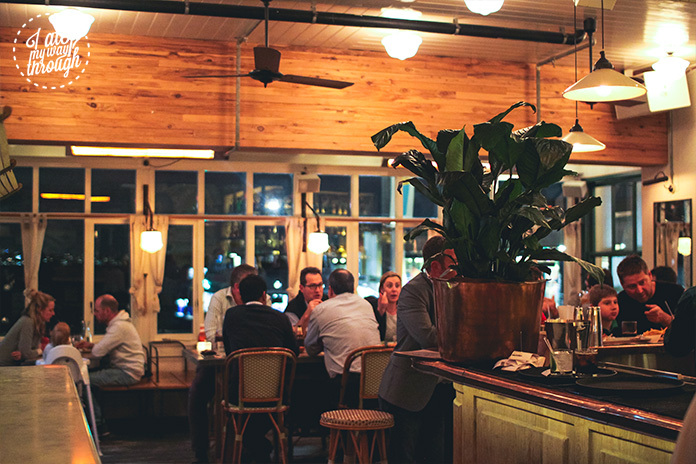 This deal from Tuesday to Thursday sees guests receive three courses and a drink for $45. Great for a lovely catch up with friends or mid week adventure where you can be carried to a beach shack oozing charm and character. Jumping off the ferry, after a breezy cruise from the city we were transported to a beach holiday! As we stepped into the chic beachy space of Papi Chulo the interior absorbed us with its gorgeous pink cane chairs, amber timber finishes, cool South American style fans, art deco lights and green vines & ferns decorating the room. 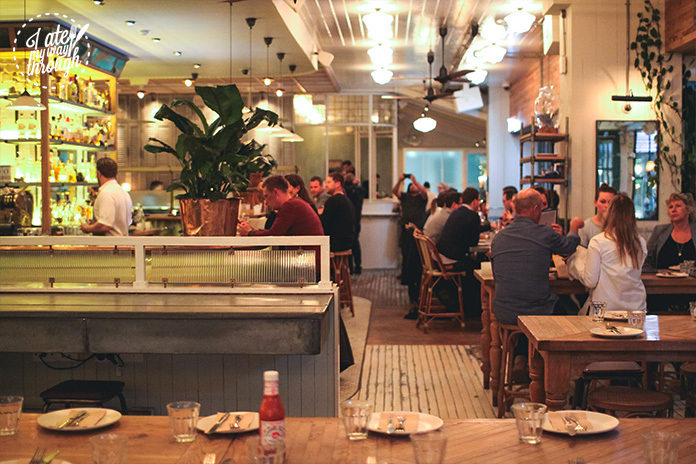 Reminiscent of summers spent in an old shack by the beach, this proves the perfect dinner destination as the weather warms up and daylight savings looms, one can sit at the window seats looking out to the harbor. To start we were served pea guacamole with tortilla chips. 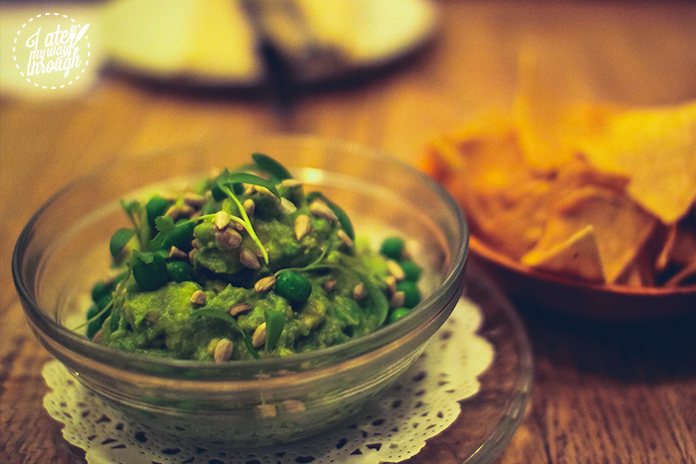 The green guac had the addition of green peas proving extra tasty, whilst the dip was finished with little pepitas on top. These little bursts of crunch added welcomed texture to the creamy avocado and pea mix. 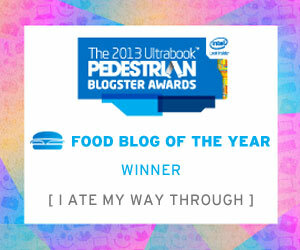 It embodied the perfect amount of saltiness which was enhanced by the crispy housemade tortilla chips. Everyone was battling each other to steal the last bits of green goodness from the dish. For the mains one can choose from a selection of dishes including Pulled Berkshire Pork, Mussels & Frites or a healthy Beetroot salad. I was more than happy with my choice of the Malaysian chicken platter, tortillas, lettuce. 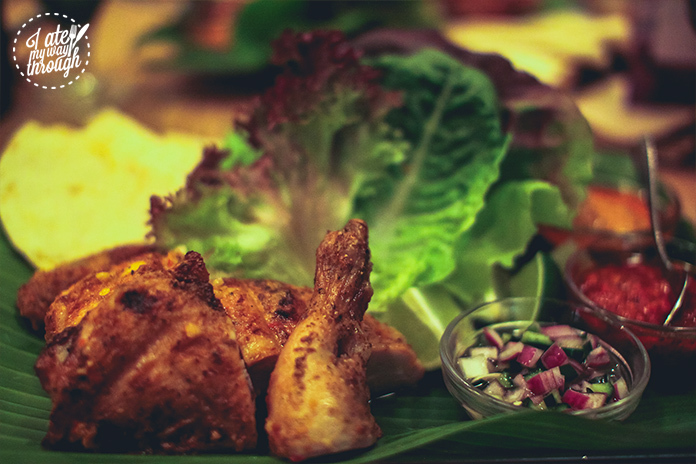 This featured a small chicken half that had been marinated in a juicy spicy Malaysian mix alongside some fresh cucumber & Spanish onion salsa, chilli sauce and finger licking good Malyasian sauce. Designed as a DIY wrap kit, one places the chicken in the wrap, alongside some salsa, sauces and fresh lettuce, devouring it with their hands or elegantly with a knife and fork- you be the judge! 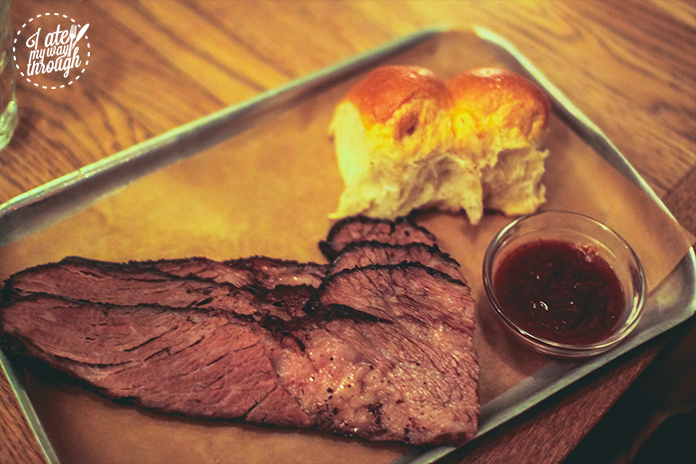 The Wagyu brisket with bread rolls and BBQ sauce is a great for the guys out there. Thin slices of tender and flavoursome brisket are delivered on a plate with Papi Chulo’s signature smokey BBQ sauce, and some gorgeously light & fluffy bread rolls. Meat is one of Papi Chulo’s signatures with their Grill, Rotisserie & Smoked BBQ dishes proving the centerpiece of their menu. Again the DIY element takes the stage, as you become the chief sandwich creator. 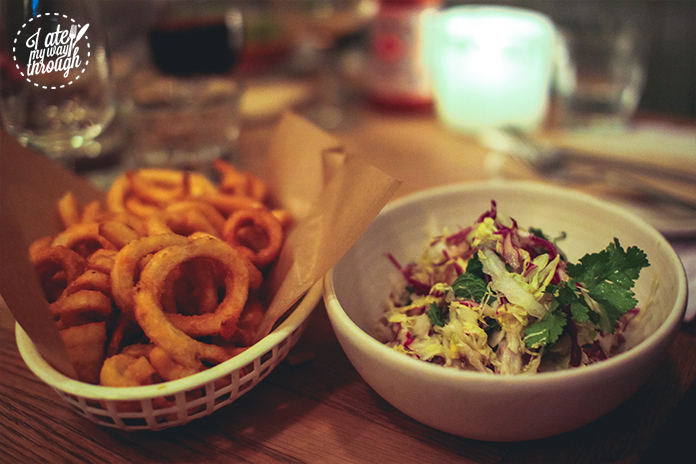 The mains are served with curly fries and Vietnamese slaw for the table. The curly fries were incredible! The ultimate guilty indulgence, deep fried with golden deliciousness so amazingly crunchy and moorish. The Vietnamese slaw was a mix of cabbage and coriander which added a light freshness to the mix and made us feel a little bit healthy! The desserts all sounded so good, it was difficult to pick two of the three! 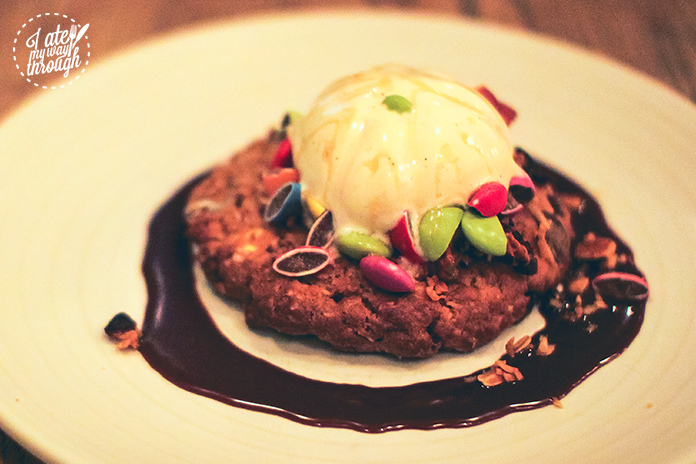 The Monster cookie, nutella, caramel swirl ice-cream, had my inner chocoholic and sweet tooth screaming inside! The choc chip cookie was huge, and despite being dense it wasn’t dry but the perfect texture to soak up all the creamy goodness on top. The smarties added a burst of colour and crunch, transporting me back to my childhood and the rectangular treat packets of Smarties my parents used to bribe me with! The caramel ice-cream with its caramel drizzle was rich and velvety, complemented by a lashing of Nutella circling the plate- this is definitely a must order. Meanwhile the elegant coffee profiterole combined a delectable coffee and hazelnut fusion together. 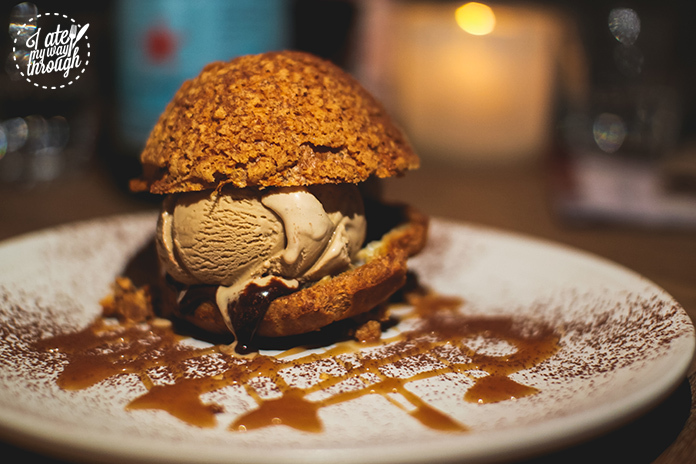 A delicate choux profiterole with a sweet hazelnut crust on top is filled with coffee ice-cream and chocolate sauce on the base. It sits on a bed of crunchy hazelnut pieces and the plate is decorated with salted caramel sauce. As you slice through what is essentially an upmarket ice cream sandwich or ice cream burger if you may, the ice cream oozes all over the plate in a glorious mess. This one has you wanting to lick the plate clean! 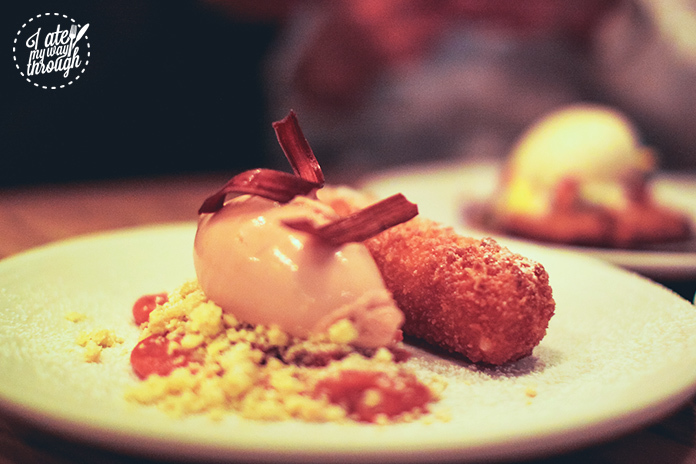 The other choice available is the beautiful Crema fritta, quince and rhubarb ice-cream. Little dough balls are deep fried with golden shells, alongside poached quince and crumble bits. This sat beside by a rosy pink rhubarb icecream and piece of candied rhubarb, dusted with a sprinkling of icing sugar to top it all off. This dish was different, perfect for those not looking for anything to sweet with the strong tartness of the rhubarb ice-cream. Papi Chulo provides the perfect chance for a mid week getaway to a beach shack just a stone’s throw from the CBD. The special Who’s Your Papi menu offers great food in a fun atmosphere with an affordable price tag! 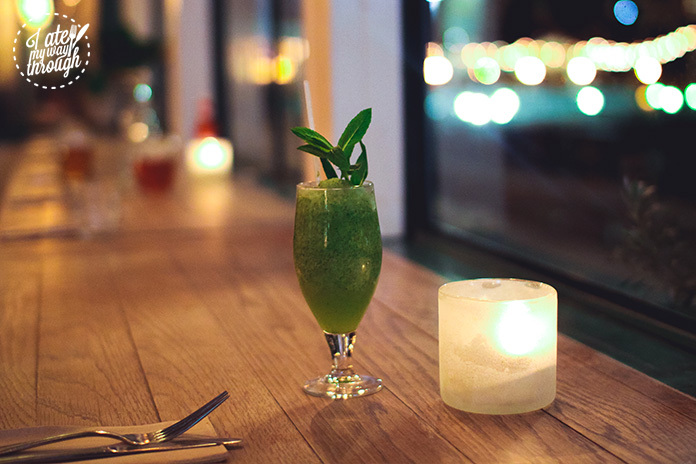 Jump on the next ferry from Circular Quay or book ahead to get a taste of summer at what is one of Manly’s best restaurants!